I decided that I would stand with the fasters. My first Fast will be Wednesday October 1, 2014. The idea of fasting on the first day of each month appealed to me on a few levels. Firstly, because I already practice compassion and self-discipline: when, on occasion, I hear my inner voice announce that I need a treat or something sweet, I think about mother’s like me who may be four blocks away or hundreds of thousands of miles away, living in poverty who don’t have the luxury to casually escape into indulgence. Thinking about those mothers snaps be back into reality and gives me strength to not give in. It strengthens my resolve to both take better care of my health and environment. Therefore, going forward, I can Fast For The Climate on the first day of every month. Secondly, on a regular basis, I think about the impact products of modern commerce have on our climate. The shipping, manufacture including pre-production and post-consumer waste of products, which affect everyone but mostly affect those living in poverty. Can each of us be more mindful about our needs versus our wants? I can practice making less garbage, which means being more mindful about not buying products that come in plastic or single-use disposable packaging. I can forego that chocolate that comes in single-use packaging even though it can be recycled, I know that recycling is something that should be practiced as our last resort but has become a way of justifying selling and buying more products. Lastly, I think about the ingredients of man-made products. What are these ingredients made from? Are they processed? The mere act of processing creates by-products which need somewhere to go and often end up in landfill or polluting our waterways. If we are consuming products that are highly processed, then our health declines. As our health declines we become dependant upon pharmaceuticals which eventually enter our water ways therefore contaminating the very water systems that support life. Think global numbers here and think about how many pharmaceuticals the average person from North America alone is prescribed. Now think about our water quality. We can change this. It should be everyone’s goal to practice eating real, unprocessed food and to not eat “products”. We should prepare our own food, which is very different from assembling ingredients that are ready-made store bought ‘products’. We need to change our behaviour from eating on the go with the belief that we can swallow our nutrients in liquid form while multitasking. We need to join the slow food and plastic free movements to ensure a happy healthy civilization (including all beings) on an equally healthy planet. “To keep in health this rule is wise. Eat only when you want and sup light. Chew well, and let what you take be well cooked and simple. He who takes medicine is ill advised. Beware of anger and avoid grievous moods. Keep standing when you rise from table. Do not sleep at midday. Let your wine be mixed (with water), take little at a time, not between meals and not on an empty stomach. Can you imagine what Leonardo da Vinci would say about our global climate crisis? You can subscribe (upper right corner) to receive future posts via email. 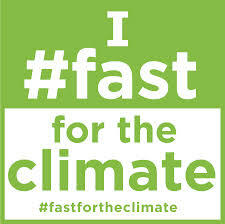 I will post “Reflections on My First #fastfortheclimate by the end of the week. I will share what my kids think of this and how I can include them without having them Fast.